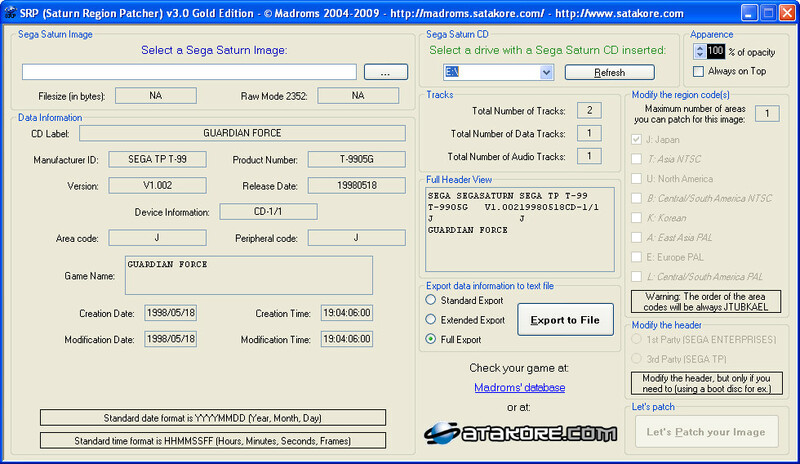 This database will be a complete database of every games and demos released for Sega Saturn around the world. I have already collected related informations for more than two years. This is a long work and is still in progress. Each entry represents a unique cd you could find. So, for a three cds games, you will find 3 entries. You could also find 2 or more entries for the same cd, it is the case when a game got an internal revision (for example, you could check Albert Odyssey USA: there are 2 entries, one with version 1.010 and one with version 1.100). Also, in Japan, the Satakore re-releases & limited editions are, most of the time, identical to the normal release of the game, in term of data written on the cd. So you will not find multiple entries for them in my database. For more detail, please check this help. You could find the database in 2 form: a huge html file or a php page with multi-criteria search function. Also, in this latter form, each entry have a link which connect it to the database of Satakore.com. 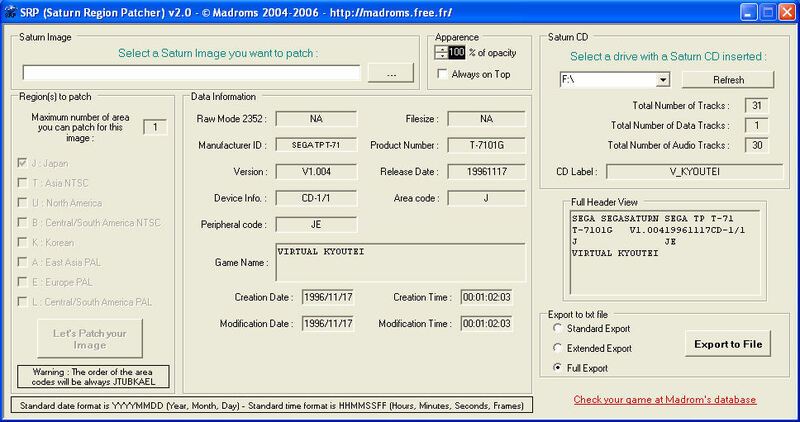 This tool is a Saturn Region Patcher (SRP) for Sega Saturn images. - There is a limit for the number of area codes you want to put on an image. This limit is written in the "maximum" box. When you have checked a number of checkboxes equal to the limit, all the other checkboxes become disabled. To enable them again, just uncheck one checkbox. - This limit is due to the fact that there are some data just after the last area code in the 2nd sector (where they are in format like "For JAPAN"). The limit avoids the replacement of those data with extra area codes. If you find any bugs or have any improvements you want me to add, feel free to e-mail me at madroms<at>free<dot>fr (feedbacks are also welcomed). SRP now works under Windows Vista. SRP now reconstructs the EDC and ECC fields automatically for RAW Mode images. So no need to use CDmage anymore. SRP allows direct drag and drop for CD images. SRP lets you change the header for first and third party. It is only useful for people that own a Sega Saturn boot disc. SRP links to 2 different databases: the old tech db (that has been migrated from madroms.free.fr to madroms.satakore.com) and the satakore.com games and demos database. I continue to work on each database (the project is NOT over) but I didn't updated the online db yet (at the date of the release of SRP v3.0GE). - with Alcohol 120%: choose "Writing method" = "DAO/SAO" and check "Bypass EFM Error"
01/ Install CDmage where you want on your harddrive and launch it. 02/ Open you image with CDmage. For bin/cue and CloneCD images, do not choose the .BIN file in the open dialog box but choose the .CUE or .CCD file instead. Also, CDmage doesn't work with Alcohol 120% .MDF/.MDS and DiscJuggler .CDI v4 images. 03/ Select the "Sector Browser" option in the View Menu (Picture #01). 04/ Select the "Scan For Corruption" option in the Action Menu (Picture #02). 05/ In the dialog box, choose "Sector range" from 150 to 151 (Picture #03) then click the Scan button. 06/ You will get this dialog box (Picture #04) telling you there are 2 corrupted sectors. 07/ In the sector browser, select the 2 lines that appeared in the Errors tab then Right click on them and choose "Rebuild Sector Fields..." option (Picture #05). 08/ In the next dialog box, verify that all the box are checked (Picture #06) then click the OK button. 09/ You will get this dialog box (Picture #07) telling you cdmage successfully rebuilt 2 sectors. 10/ Now you can close CDmage and burn your newly modified image with your favorite burning software without any problem. Just modified a little bit the proposed filename when exporting to text file. 1) Ability to check your Saturn CD directly from a CD/DVD Drive. The Full Export is only available when reading header directly from a Saturn CD. - Don't forget to fill the 2 blank records: "CD Made in" and "Matrix Information"
"CD Made in": just fill in the country/area where the CD has been made. Where to look for such a thing ? => just look at your CD, on the cover art side. You will probably see something like "MADE IN USA" or "EU" or "JAPAN" or "IRELAND"... This is what I need. If this information is not available on the CD, just fill the line with "Unknown". "Matrix Information" = Numbers and Letters written on the inner serial of the CD. All characters and space are very important (for example, thin space must be reported as little as it is, but multi-space could be trim to one space only). For more information about the Matrix, just read the Help file of my Database (http://madroms.satakore.com/db/db.php). 6) Ability to check my Database at http://madroms.satakore.com/db/db.php directly from SRP: you can check if I already have the information for the game you test on my Database. - No entry found => perform a search on the Database with the title of your tested game and check for the area codes for each entry found, then compare them with the ones on your image. In this second case, if I have some missing information, you can't directly know if your image has been converted. So you can export to TXT file all the information and send them to me (at my e-mail or post on my forum at http://daiichi.free.fr/forum/); or you could wait I will update my Database with new entries filled. 7) Corrected some minor issues and changed some captions. Thanks to SegNin for telling me it does not work under Win98SE, due to some functions not implemented in the kernel32.dll of this OS. You can always download v1.1 which works very well on Win98. The link is at the bottom of the page. If any of you have some problems, just post a message on the forum. Also, if it works well on some Windows OS, just let me know, so I can make a compatibility list. Thanks.